(Photograph by: Greg Bixby) The 141st Kentucky Derby drew an all-time record number of attendees: 170,513. Arriving for the 141st Kentucky Derby, I caught a glimpse of Millionaires Row. I wasn’t at Churchill Downs, however. My commercial flight had just landed at Louisville International Airport and was taxiing to its gate. I peered out the window and saw row upon row of private jets that had been lined up and left by their affluent owners to taunt us commoners, and even the slightly more privileged first class passengers onboard. Impressive in number, there were roughly a hundred planes that I could see from my carefully selected exit row seat. Having paid extra for Delta Comfort+, I gained more legroom and a free alcoholic beverage. Not a bad way to start my first trip to watch the greatest, fastest, most exciting two minutes in sports, complete with Thoroughbred horses, mint juleps, live entertainment, and photo ops. In preparing for my experience at Derby, I read pages of online information regarding the race’s history and traditions, betting tips, security procedures, and recommendations on attire. The official Derby website offered a host of pictures that supported the importance of hats for ladies and proper clothing for all. I looked through photos from last year’s event to learn what was acceptable amongst the crowd of spectators, which included highly successful celebrities and businesspeople, as well as ordinary women, like me. I wanted to dress appropriately enough to blend in. Beyond the advice I garnered from the internet, my greatest ally was one of my friends. 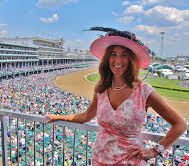 She’s a perfect southern belle–Maria knows Kentucky; she’s from Louisville; she’s passionate about Derby. Relying upon her expertise and guidance, I gained comfort in my evolving plans, which heavily focused on exactly what to wear, what to expect, and how to fit in. In retrospect, Maria had started training me for Derby Day many years ago when I attended a Derby party at her home. Other than neglecting to invite Josh Groban to sing “The Star- Spangled Banner,” she provided the essentials. We decorated hats, drank one too many mint juleps, ate Derby pie, and cheered for the stars: the horses. Her party was a far greater introduction into the sport of horse racing than my husband Greg’s and my earlier attempt to figure it out on our own. We were still in college when we drove south from Michigan to Louisville Downs for harness racing. The first horse on which we placed a bet was injured during its race, went lame and settled in last place. Our next chosen hopeful literally collided with another team, quickly recovered from the accident, but was confused and ran in the opposite direction. There were no cash winnings for us on that cloudy, gray day. I think it may have had something to do with our strategy for picking a winner. We simply relied upon dumb luck (had we won, it would have been “good luck”) to guide us in weeding through the names of the horses. Winner or not, I remember feeling like an outsider, a northerner, a “Damn Yankee.” Nobody specific made me feel that way. I was self-aware that I didn’t fit in. Because I have a distinct, well-established, born and bred Midwest accent, I didn’t talk like I was from the South. A few things have changed in the twenty-eight years since I whimsically bet on the horses in Kentucky. Louisville Visitors Center welcomes all. Second, I’ve learned the biggest secret to blending in: pronounce “Louisville” correctly, y’all. Thanks to Maria, I’ve had that one down pat for years. “Say Louisville as if you have marbles in your mouth,” she once told me. I’ve practiced it ever since: “Looavul.” Got it. In addition, my betting strategy for selecting a winning horse has improved. I’ve learned that, before the big race, it’s important to take a look at the horses in the paddocks, pay attention to the trainer’s and the jockey’s reputations, and consider the odds. Ultimately, going with a hunch can settle any last minute uncertainty. What hasn’t changed is the fanfare and excitement of Derby Day. It calls to people worldwide and becomes a bucket list item for many, the super-rich and the not-so-rich alike. As a result, people-watching has become a highly anticipated form of entertainment. As I walked around the grounds of the 141st Kentucky Derby, my eyes gravitated right to the hats. I suspect that each hat revealed something about the personality of the one wearing it. One woman wore a creative hat that replicated the Twin Spires and had two brown horse heads protruding from the base. Another hat was playfully covered in larger than life-sized pink petals and looked like a giant flower. Plastic champagne bottles and roses were popular adornments for many other expressive people. Personally, I chose a fairly modest, medium brimmed hat topped with ribbons, flowers and feathers, all of which complemented the shades of pink and green in my dress. Decisions, decisions. What do you wear to Derby? I spotted an ensemble that I liked best on one of my male hosts. He wore a red and white checked sports coat, a white shirt and dress slacks, the latter of which he tucked into black riding boots. He completed his outfit with a hand-painted silk tie displaying the image of a winning jockey sitting upon a champion horse, blanketed in roses. The pair portrayed in the tie coincidentally resembled my favorite contender: American Pharoah. How had I arrived at my favorite? I’d like to say that it was because American Pharoah looked powerful and intimidating; Bob Baffert trained him; Victor Espinoza would be riding him; and the odds were good at 5-2. In complement to all those strengths, I had found remnants from an interview in which five retired Hall of Fame jockeys and a retired Hall of Fame trainer admired and touted American Pharoah. But then Maria sent me a video clip of “Puppy Predictors 2015 Kentucky Derby Edition” from The Tonight Show Starring Jimmy Fallon. She pointed out that the results could jinx my horse. In the end, I persevered through the decision making and stood strong with my original conviction to place a winning bet on American Pharoah. I had relied on more than a hunch to help me recover losses from the day’s earlier races. Since a friend had recently starred as Pharaoh in Joseph and the Amazing Technicolor Dreamcoat, I knew all along upon whom I would place my winning bet. Next year, I may simply look for a lucky tie. I enjoyed to hear how yu made your bet. This past weekend my 15 year old asked whether investing in the stock market is the same as gambling at the races. I should have sent him to read your article. Although a horse may have a great trainer, jockey, genes, the odds makers adjust for all that. My money is better invested in a team of managers running a company than one race on one day for an animal, who is not smarter than a fifth grader. Sounded like fun. And I like your hat.